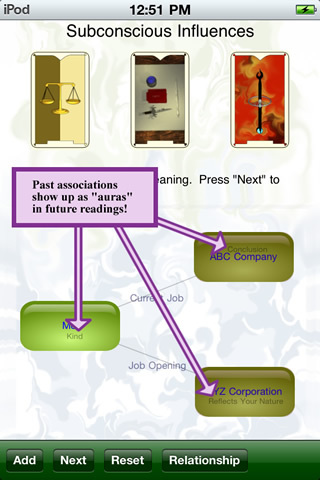 Miasma is a Tarot card app that remembers the topics you contemplate. 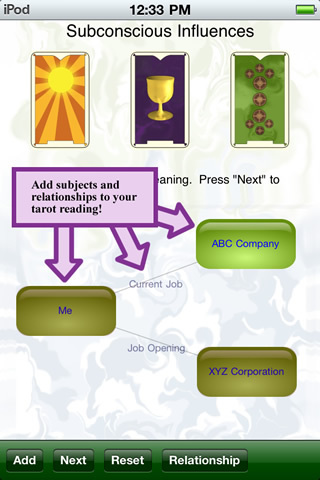 Simply add your subjects and relationships, and you can associate the Tarot meanings with those subjects. Store subjects of contemplation so you can have repeat readings done. Store relationships between the subjects for easy visualization. If you feel a word from a Tarot card is meaningful to your subject, associate the word with the subject. Review the reading at the end and think about why you chose the word associations you did. Past word associations will show up as an "aura" around your subjects in future readings. © 2014 Mode13 LLC. All rights reserved.